This is the story of Maurice Hannigan, who, over the course of a Saturday night in June, orders five different drinks at A tale of a single night. The story of a lifetime. To ask other readers questions about When All Is Said, please sign up. Are there any other winners who still have not received their copy from the 8/20 giveaway too? We would be happy to look into this. "I'm here to remember - all that I have been and all that I will never be again." When All Is Said tells the life story of Maurice Hannigan. Now an elderly man, he sits alone in the bar of the Rainford House Hotel. Over the course of one evening, he raises toasts to five different people as he recounts the story of his life up until that moment. Like all lives, Maurice's has moments of pure happiness, moments of darkness and misery, mistakes made and things left unsaid. I think perhaps the quiet strength of this book - and the saddest thing about it - comes from knowing deep down that there's really only one way it can end. Past tense, decade-spanning family stories are totally my thing. This one was no exception. I got a very strong John Boyne The Heart's Invisible Furies vibe reading this, and it came as no surprise when Griffin thanked him in the acknowledgements at the end. There's also a touch of A Man Called Ove in here, too. Griffin takes us from the old-fashioned Ireland of the past to the present. We revisit Maurice's childhood and see how he struggled at school because of his dyslexia, and, of course, had no one to give him guidance on it. In those times, his only option was to turn to work on the farm, which resulted in him working under an abusive employer. Later, we see him fall in love and marry, and have kids, but all this is told through the five toasts; all relating back to the one person at the centre of that chapter. Tony never stopped telling me I was full of greatness. People didn’t really do that back then, encourage and support. You were threatened into being who you were supposed to be. It's a very effective kind of storytelling. The old man's view, combined with the past tense, makes for a very nostalgic tale, tinged with bittersweetness from start to finish. Many sad things happen but for me it was saved from being too maudlin by Maurice's fire, love, and grumpy sense of humour. It is amusing to hear this old-fashioned guy recount a visit to a fertility doctor and bemoan the discussions of "'Rhythm' fecking this and 'cycle' fecking that". Another strength of the story, I feel, comes from the exploration of how the same thing can look quite different in hindsight, not just for Maurice, but for humanity as a whole. In Maurice's case, minor acts of revenge turned out bigger than he'd ever anticipated, and he also saw his wife's actions in a new light as he aged. For humanity, someone who was written off as "stupid" is now recognized as having a learning disorder that can be helped; mental illness, too, is now better understood. There was a love but of the Irish kind, reserved and embarrassed by its own humanity. A beautiful, sad, funny book, made all the more interesting because many of the characters, especially Maurice, are difficult, or selfish, or grumpy, but we still come to love them. It broke my heart. Warnings for grief, abuse and (view spoiler)[suicide (hide spoiler)]. A subtly beautiful story that celebrates life, loss, and, most significantly, love. One night in Meath, Ireland at a hotel 84-year-old Maurice Hannigan makes five toasts to five people. In doing so, he recounts those who have shaped his life in the most important ways. His tribute to these five individuals reveals his accomplishments, regrets, and unwavering love for his friends, family, and his wife, Sadie. This i A subtly beautiful story that celebrates life, loss, and, most significantly, love. This is a lovely, touching read that is beautifully written. Maurice’s story is both understated and raw. I loved getting to know him and reading his truthful account of his life. He doesn’t sugarcoat or make excuses. He basks in the glory of his small victories. In Meath, he is known for his rich speaking voice, and as a reader, his voice drew me in with his ability to take a simple story and elevate it into something special. In Maurice, Griffin has created a character who is authentic, complex, and charming. I felt his emotions and heartbreak. My favorite toast was to his wife, Sadie. I was a bit shattered in the end, but at the same time, I understood that this was the right way to end Maurice’s story. Highly recommended! Warning: have tissues handy! Zoeytron Love your review, Meredith. OCmom Beautiful and succinctly put. An emotional lifetime journey in one night’s read. There are 5 star books and then there are five star books with a story that make me wish I could give more stars. This is one of them. There are debut novels and then there are debut novels which after I’ve finished reading, have me thinking, wow what a debut and hoping that the author is working on her next book. This is one of them. I don’t drink much beer, let alone one “not from the fridge” and certainly not stout. I don’t like whiskey at all, but I wanted to be sitting at this bar in Irelan There are 5 star books and then there are five star books with a story that make me wish I could give more stars. This is one of them. There are debut novels and then there are debut novels which after I’ve finished reading, have me thinking, wow what a debut and hoping that the author is working on her next book. This is one of them. I don’t drink much beer, let alone one “not from the fridge” and certainly not stout. I don’t like whiskey at all, but I wanted to be sitting at this bar in Ireland, drinking every one of the five toasts to people in his life, in his heart along with Maurice Hannigan. Maurice Hannigan had me from the first page. It felt like a memoir, touching on events and people in his life, his life exposed as he tells these stories. The heartache and grief and happiness that life brought to him and the excruciating loneliness as we meet him at age 84. I felt his grief, understood his regrets and felt the love he had for these people in his life: his beloved brother Tony, his first child Molly, his sister-in-law Maureen, his son Kevin, and the love of his life, Sadie. I won’t tell you here about them because it’s Maurice’s story to tell and it’s best to hear it from him. I recommend that you do. This is a beautifully told story of grief, guilt, regret, family and the depths of loneliness tempered only by the love he feels for these people. A truly amazing debut, a story rendered in a unique and near perfect way. Here’s to you Maurice, a character deserving of being remembered. This was a monthly read with Diane and Esil, my favorite book buddies. I was glad to have shared this one with them. Here’s to you, my friends. Angela M Thanks very much , OCmom ! This is an exceptional, undeniably Irish, debut from Anne Griffin, the prose is effortlessly engaging and it is simultaneously heartbreaking and life affirming as we get intimately acquainted with the life and times of 84 year old Maurice Hannigan. Hannigan has packed up his life, leaving no loose threads prior to booking the most exclusive suite at the Rainsford House Hotel. Early on, we cotton on to how the night will end, but before that, Maurice settles in for an evening at the hotel bar to This is an exceptional, undeniably Irish, debut from Anne Griffin, the prose is effortlessly engaging and it is simultaneously heartbreaking and life affirming as we get intimately acquainted with the life and times of 84 year old Maurice Hannigan. Hannigan has packed up his life, leaving no loose threads prior to booking the most exclusive suite at the Rainsford House Hotel. Early on, we cotton on to how the night will end, but before that, Maurice settles in for an evening at the hotel bar to raise a toast for the five most important loves of his life. They are Tony, his brother, Molly, his daughter, Noreen or Auntie No-no, his son, Kevin, who emigrated to New Jersey, USA, becoming a notable journalist, and lastly, but of the most vital importance, his wife, Sadie. As Maurice reminisces, we become aware of just how close his bond with Tony is, of how school became a tortuous experience as he became convinced of just how stupid he is. He leaves at 10 years old to work, like his mother, for the local rich family, the Dollards, where he undergoes a plethora of the most unhappiest of experiences that are to leave him scarred for life and shape him to be the most unforgiving of men. The scales shift as through the years the Dollard fortunes drop substantially whilst Maurice becomes a astute entrepreneurial farmer, buying up the land around his farm, becoming financially secure and wealthy. He falls for Sadie hook, line and sinker, and to his surprise and joy, she returns his love. Sadie's sister, Noreen, is fiercely drawn to the sparkle, and she will go to any lengths to acquire it when she sees it, not afraid of making a fuss in public. Kevin makes a ritual of providing his father with rare whiskies. To Maurice's eternal regret, he has not been an expressive man, he has never been able to articulate the depth of his love to those nearest and dearest. It becomes transparently clear that loneliness has seeped into Maurice's heart and soul. This is a perfect example of a book I didn't want to end. I just fell in love with the main character to the point that by the end of the story I felt like he was an old friend. Maybe this book isn't going to be special for everyone, but I found it to be incredibly touching and brilliant. 84-year-old Maurice Hannigan takes a seat at a hotel bar in a small Irish town. Before the night is over, he will toast 5 people who made an impact in his life. The thing I kept thinking about while reading is This is a perfect example of a book I didn't want to end. I just fell in love with the main character to the point that by the end of the story I felt like he was an old friend. Maybe this book isn't going to be special for everyone, but I found it to be incredibly touching and brilliant. The thing I kept thinking about while reading is how there are certain moments in life that might be insignificant to others, but they end up shaping you as a person. They might be things you want to forget, but you can't deny they helped define you. And that's why I was so moved by Maurice as he revisited these moments. The premise of the book sounds so simple, but yet there is so much substance. He's a complicated man and I was incredibly moved as I learned everything about him, the good, the bad, and all the stuff in between. I'm not even joking when I say it felt like I was sitting right there with him at the bar and when the night was over, I didn't want him to leave. I love when I feel emotionally connected to a character because it's a feeling that doesn't always happen, at least not on this level. I rarely pay much attention when other authors endorse a book, but I do find it worth noting John Boyne had some good things to say about the author and her novel. If you enjoyed The Heart's Invisible Furies, consider checking this book out. I won a free advance copy of this book in a giveaway but was under no obligation to post a review. All views expressed are my honest opinion. An unforgettable first novel. A quissessentially Irish novel, filled with melancholy and angst, with some great storytelling. Maurice is 84, his beloved wife Sadie gone now for two years. His only child, a son lives in America with his family. He now sits at a bar in a restaurant, intending to toast the five individuals who had the greatest impact on his life. He has reserved the VIP suite for the night. The bar where he sits, the hotel he is in, had once been the house of the wealthiest family An unforgettable first novel. A quissessentially Irish novel, filled with melancholy and angst, with some great storytelling. Maurice is 84, his beloved wife Sadie gone now for two years. His only child, a son lives in America with his family. He now sits at a bar in a restaurant, intending to toast the five individuals who had the greatest impact on his life. He has reserved the VIP suite for the night. The bar where he sits, the hotel he is in, had once been the house of the wealthiest family in the village. This house figured largely in his youth, and the memories are not good ones. He is lonely,sorely misses his wife, feels as if he belongs nowhere, to none. Now though, Maurice has a plan. As he drinks each drink we learn the story of his life. The importance of a gold coin, which is also the continuous item that travels through his stories. Maurice is very likable, a flawed character, and so very human. It is a novel with a few gothic undertones, one filled with guilt and envy. Love that couldn't be expressed. A sensitive exploration of guilt and regret. A quiet novel, a heartfelt story that feels very real. A story of a father and son that had trouble connecting. The last chapter is an emotional slayer, but the memorable last line brought the curtain down. One of the best last lines i have ever read. Fans of the late, great William Trevor will appreciate this novel. Reading with Angela and Esil, as always priceless. I am becoming a huge fan of Irish stories and authors! I loved 84 year old Maurice, who has lost his beloved wife 2 yrs ago, and isn’t doing well without her. He plans a memorable night at a hotel bar that holds a personal history...and through the course of the night makes narrative toasts with a fine whiskey to five people, this followed by a stay in the honeymoon suite at the same hotel. At each toast during this night, we find out the history of Maurice and the significance of each of these five people in his life. I so enjoyed his story! Recommended! I absolutely hated having to step down from that Bar Stool by the end of this Novel, but I dont want to over stay my welcome as there are many customers awaiting that stool so they can take a turn getting to know Maurice and his life story . A thought provoking and captivating novel that will quite likely break your heart. I adored it. This is a debut novel by Anne Griffen, and I can see why this lady has won the John McGahern award and short listed for the Hennessy award as her imagination a I absolutely hated having to step down from that Bar Stool by the end of this Novel, but I dont want to over stay my welcome as there are many customers awaiting that stool so they can take a turn getting to know Maurice and his life story . A thought provoking and captivating novel that will quite likely break your heart. I adored it. This is a debut novel by Anne Griffen, and I can see why this lady has won the John McGahern award and short listed for the Hennessy award as her imagination and confidence as a writer really comes to light in this wonderful novel. This lady is not just a great writer but also a great storyteller. A terrific sense of time and place spanning from Ireland of the 1930s to the present day. At the heart of this story is a strong man who struggles with expressing emotion, a man who fiercely protects his memory and his past and whose secrets come back to haunt him. Moving and beautifully written, Anne Griffin captures the Irishiness of the Irish without being over dramatic or twee and writes a pure and simple back to basics story which in my opinion is on a par with John Boyne and Maeve Binchy and Sebastian Barry. I was drawn to this book solely by its cover as I browsed in a local bookshop, The image on the cover has a wooden bar stool, and the words, Five Toasts, Five People, One lifetime. I didn't even need to read the back cover as straight away Ann Griffin had caught my attention. The best characters and the best stories can be found by sitting up on a high stool beside an elderly man in a bar in any small town in Ireland. "84 year old Maurice Hannigan sits alone at the bar in the only hotel in a small Irish town. Pull up a stool and charge your glass because Maurice is finally ready to tell his life story to you, five toasts to the five people who have meant the most to him." A story full of emotion, it made me laugh and cry and I can't wait to see what Anne Griffin writes next. Maurice was a very typical Irish man of his time with his his thoughts and opinions , set in his ways, a man with a large chip on his shoulder and a man who wont be bowing to anyone. I found so much of my own father in this man, not in the story but in his sayings, his love of the land, and his family his companionship with his dog, you often wondered if that dog could talk what he could reveal of this quiet and lonely man, the pride of family and hard work ethic and the want to succeed and be succeeded, I have fallen in love with a couple of characters in the past year Gus Lonesome Dove and Eleanor OliphantEleanor Oliphant Is Completely Fine and now I can quite happily add Maurice band of characters. Stories like this need to be read and savoured as there is an honestly about this story of Maurice that we seldom find in fiction. I think many readers will get this one. Gosh, I must have been under a rock for years ignorant of the high quality Irish fiction that I am gradually discovering. Maeve Binchy, Patricia Gibney, Tana French, John Boyne, and now newcomer Anne Griffin are some of the wonderful Irish authors I have been delighted to come across since joining Goodreads five years ago. This book is shockingly a debut as a honey of a gem it is! It features Maurice, an 84-year-old Irish farmer, who has lost nearly everything and everyone he has dearly loved and feels he is at the end of his life. We join him over a few hours spent at the bar in an Irish hotel as he drinks a toast to the five most important people in his life. If you are looking for action, suspense, or adventure, move on to something else. This is a slow contemplative journey, one where the storyteller takes the time to stop and smell the roses (or less delightful odors) along the way. Maurice is not a perfect man. He knows that better than anyone else, and he accepts it, as that is who he is. He admits his shortcomings and hopes he can be forgiven, but understands that will not always be the case. As he takes one last stroll through the highlights and lowlights of his life, he is addressing his son Kevin who is actually far far away in America. He reminisces about his joys, sorrows, successes, regrets, and moments of pride. Even on this night he finds a type of closure with a few final issues. I felt I really got to know Maurice. Accompanying him on his final exploration of life was heartrending and an experience I won’t soon forget. Such a quiet novel, yet so profound. I look forward to whatever Ms. Griffin writes next. When All Is Said is highly recommended for everyone looking for a moving, meaningful read. Thank you to Net Galley, St. Martin’s Press/Thomas Dunne Books, and Ms. Anne Griffin for an advanced review copy. Opinions are mine alone and are not biased in any way. What a grand Irish tale and well done debut! I truly wanted to start at the beginning and read it again! Encouraged....Supported....and I'm guessing Inspired by John Boyne, Anne Griffin has given me my first SUPER FAVORITE of 2019. Let's start with.....the home, nursing home, that is...."What poor widow or widower living alone out there hasn't dreaded its arrival." Next.....meet Mr. Maurice Hannigan nicknamed 'Big Man' by his beloved older brother, and get ready to travel through his tumultuous life from childhood to aging adult while he sits at a local hotel bar...alone...in a small Irish town ready to remember and toast the lives of five special people. While he shares.....his memories, we meet family and friends...including Gearstick the dog, experience good times and tough times....grief and regrets. We even discover a few characters who aren't what we first thought them to be. Wonderfully told and memorable. Loved it! Eighty four year old Maurice Hannigan is ready to say goodbye. All his affairs are in order, property sold, dog given to new owners, money in various accounts for various people, things given away, boxes packed with names of who gets the contents, everything done and sorted so he can enter a nursing home the next day. At least that is where he tells those in the know, that he is going. There are five people whose memories he want to toast first though. One of the most poignant is the toast to hi Eighty four year old Maurice Hannigan is ready to say goodbye. All his affairs are in order, property sold, dog given to new owners, money in various accounts for various people, things given away, boxes packed with names of who gets the contents, everything done and sorted so he can enter a nursing home the next day. At least that is where he tells those in the know, that he is going. There are five people whose memories he want to toast first though. One of the most poignant is the toast to his late brother. The love between Maurice and his older brother Tony, was something most people could only hope to have. Five years older than Maurice, Tony let Maurice know he would always be there to protect Maurice. Maybe reading wasn't Maurice's thing but Tony knew that Maurice would win in life, doing other things just as big or bigger than reading. When people asked Maurice what he wanted to be when he grew up, Maurice said he wanted to be Tony...it was as simple as that, nothing was better than Tony. The last person Maurice toasted to was his late wife, Sadie, who had died two years earlier. It's Sadie's death that has broken Maurice's heart and spirit and his depression is a bottomless pit. Maurice was always faithful to Sadie, never wanted another woman, but he knows he let her down in ways that he knew he was doing at the time. Stubbornness was always strong in Maurice, he was a stubborn man, set in his ways, always after money even after he had more than enough, despite the fact that Sadie didn't like that he was so intent on earning more money. So they didn't talk about money but at the same time, Sadie knew she could never order tea with her Sunday dinner because Maurice said they could have tea at home, instead. When Sadie rebelled, Maurice realized how much he'd hurt her at times and even then, he still couldn't just let her have her way. These types of things are on Maurice's mind as he makes his toast to her. Intertwined in these toasts is another story, a mystery, that concerns a once rich family that was not only unkind but cruel to Maurice's family. A young Maurice does something that ends up hurting that family and also Maurice gets his revenge on that family as he slowly buys up all their properties when they hit hard times. His need for revenge is what drives Maurice to keep working for more money, more than they could possibly need, and this urge colors all parts of his life. I suspected how the book would end and I was right. I felt sad during the entire book and certainly at the end. Depression can take your life while you are still alive and make you do things you might not do if you could see past that depression. Imagine you're on travel by yourself and you decide to spend an evening at a local pub. You're seated at the bar and one of the bar's patrons starts speaking—partially to you and partially to himself. With nothing else to do, you listen to the man tell his stories. At first you're not sure what to make of it all, but little by little, you find yourself fairly engrossed in what he has to say. Sometimes his conversation is entertaining, sometimes it meanders a little too much, 3.5 stars, rounded up. With nothing else to do, you listen to the man tell his stories. At first you're not sure what to make of it all, but little by little, you find yourself fairly engrossed in what he has to say. Sometimes his conversation is entertaining, sometimes it meanders a little too much, and sometimes it's even a bit emotional. This is precisely the way it felt reading Anne Griffin's charming debut novel, When All Is Said . In this case, the man is 84-year-old Irish widower Maurice Hannigan, and the pub is actually the bar of a grand hotel in town. With his wife dead for two years and his adult son living in America, Maurice is usually alone, but this isn't just any night. Tonight Maurice has decided to toast five special people in his life, and give them the due he never has. And with each toast comes a recollection of memories about that particular person, many of whom are now gone. Maurice's stories tell of love, fear, grief, family, courage, wonder, and frustration, of feeling incapable of expressing your opinions until the moment has passed you by. He's unafraid to make himself look the fool, the villain, or the one who causes pain, but he's also unafraid to illuminate his own pain, sorrow, and regret. There are people we spend our entire lives with who touch us, and there are those who leave their mark after only a short time. There are situations that define us, and our actions during those times stay with us, showing us that a moment's victory may actually lead to a lifetime of regret. But a person's life is a long series of memories, people, scores that are settled and those that never are, hearts we won and those we lost. "I'm here to remember — all that I have been and all that I will never be again." When All Is Said feels so much like the stories told by kindly old men in pubs, because that's what it is. Obviously by having the book narrated in the first person you lose the perspectives of the other characters in the book, and you're left only to wonder what they thought about different situations. But what you gain in this case is the amazing persona of Maurice Hannigan, who is willing to lay bare his own flaws while sharing what five people have meant to him. A number of people whose literary tastes I share have waxed fairly poetic about this book, so I wonder if that built it up a little too much for me. I enjoyed this but felt each of Maurice's stories went on a little too long, and while there were moments that choked me up, I was surprisingly not as moved as I thought I'd be given what a colossal sap I am. Don't get me wrong, this is lovely and charming story, but it just didn't grab me quite as much as it has others. Maybe I was affected with Grinch syndrome while reading this, in that my heart was two sizes too small. There's no other reason to explain it, because Griffin has created a memorable character in Maurice, and his story is beautiful and touching. An old man walks into a bar and sits down for the last time. He’s come to toast 5 people who have had the most impact on his life. Tony, his beloved uncle, always supportive and giving him courage. Molly, the ghost of a daughter, who becomes his voice and conscience* for what is right and wrong. Doreen the beloved sister in law whose acceptance won him a place with his in-laws. Kevin, the journalist and son, who he was very proud of but couldn’t express it. And Sadie, the love of his life. A reflecti An old man walks into a bar and sits down for the last time. He’s come to toast 5 people who have had the most impact on his life. A reflection; a gift. To be able at 84 have a clear memory of those you’ve loved. Or a curse as you recall them and have to live your life without them. A final toast to you, Maurice, for a journey you shared with us. Christine I"m glad you read this too, Jen. A wonderful change of pace from some of our usual stuff. “Five toasts, five people, five memories”. Maurice Hannigan is 84 years old... sitting in the bar of the Rainsford Hotel in Ireland on a Saturday night in June. The hotel is part of Maurice’s history and his memories. a toast to his brother, daughter, son, sister-in-law, and wife ( who died two years ago). I love the idea and significance of this book. Maurice may have picked only 5 people to toast who have shaped his life but he also i “Five toasts, five people, five memories”. Maurice may have picked only 5 people to toast who have shaped his life but he also includes sharing about his mother - his father - his uncle - friends - and opponents. highlights - happiness - struggles - guilt - sadness - business - growing up a poor farmer kid to a financially success adult - love - loss - marriage - children - failures - grief - grudges - disappointments- insecurities - regrets - dyslexia - a story about a gold coin - death - illness - acknowledgments- forgiveness - and a lot of reflecting. Society tells us what to think and what to believe but Maurice simply gave us truth!!! First 5 star novel of 2019! Anne Griffin is amazingly talented. She had me sitting in the bar with Maurice, listening to him make a toast at 84 years old to each of his five favourite people. Maurice had me laughing, crying, getting angry — including at him more than a few times — and shaking my head. Maurice grew up in a village near Dublin, and he never left. But he managed to get out of the poverty of his childhood, marry Sadie, have his son Kevin, and amass more than a few grudges and regrets First 5 star novel of 2019! Maurice Hannigan has lived eighty-four years as this story begins, sitting at the bar of the Rainsford House Hotel, Co. Meath, Ireland. He’s there to raise a toast to five people, all members of his family, in th !! NOW AVAILABLE !! Maurice Hannigan has lived eighty-four years as this story begins, sitting at the bar of the Rainsford House Hotel, Co. Meath, Ireland. He’s there to raise a toast to five people, all members of his family, in this place that has been a part of his life since he can remember. A trip down memory lane ensues, and you begin to piece the stories of his life together through these toasts as he wanders through these memories with each character from his past, all gone from his life with the exception of his son, who now lives in America working as a journalist. While these stories have an air of sentimentality to them, it is filtered through both humour and his truth about the life he has lived there, in the shadow of this now-hotel, formerly the home of his former employer, and the employer of his family members, as well. Maurice is a flawed individual, as we all are, burdened by his many regrets that he has managed to accrue through his years. One toast, one memory devoted to one person at a time, he expresses his love for each, his wish that he had done a better job, perhaps of expressing that love, perhaps, but seeking forgiveness for his faults. There is a reclusive edge to this man, which becomes apparent as he relays his story through these toasts to those people who continue to live on in his heart. Through his stories it is soon apparent that he has lived his life guarding his heart, showing his love in the only ways he’d been shown love – “the Irish kind, reserved and embarrassed by its own humanity.” Perhaps his biggest regret, that he had not shared his love in a way that showed his love for these people, who were so special to him, so as he toasts them he shares his love for them, at last. When I read about this book, it brought to mind a book that I had read three years ago and loved by Roger Rosenblatt, ’Thomas Murphy,’ another Irishman, and there is a bit of the charm that Thomas Murphy had about him in Maurice, both reminiscence on loss, love, life, death, aging and love. Having read this now, Maurice has lived a very different life than Thomas Murphy, which has given him a different view of life, perhaps, but it’s the love and tattered charm of both that kept me smiling through the tears. At the bar in a grand hotel in a small Irish town sits 84 year old Maurice Hannigan. He's alone as usual. So pull up a chair and charge your glass, because Maurice is finally ready to tell his story. He will raise 5 toasts to the five people who have meant the most to him. Stories of joy, regret, a secret tragedy kept hidden and a fierce love that never found its voice. What a heartwarming but also a heartbreaking story this is. A beautifully written story. An old man sits at the bar and toast th At the bar in a grand hotel in a small Irish town sits 84 year old Maurice Hannigan. He's alone as usual. So pull up a chair and charge your glass, because Maurice is finally ready to tell his story. He will raise 5 toasts to the five people who have meant the most to him. Stories of joy, regret, a secret tragedy kept hidden and a fierce love that never found its voice. What a heartwarming but also a heartbreaking story this is. A beautifully written story. An old man sits at the bar and toast the most important people that have been in his life. All but his son have passed away. This tear jerker of a story covers every emotion from joy, sadness, love, compassion and much much more. Intertwined with these toasts lies another story, a mystery that involves a once rich family that was cruel to Maurice's family. You will guess the ending but that won't make you think any less of this wonderful story, I do recommend this book. I'll begin this review by explaining why I chose this book in the first place. To put it simply, the author is Irish. I have become an avid fan of the modern Irish authors of late, John Boyne (who endorsed this book), Liz Nugent and Tana French just to name a few, and this debut by Anne Griffin definitely shows promise. I don't know what they are putting in the stout over there but it's working. This story involves a night at a bar with 80+ year old Maurice as he makes a toast to the five most important and influential people to grace his life. Between toasts he reflects on the history with each person in his head as if he is speaking to his son. Each story is an in-depth look into the life and times of Maurice but he sometimes swerves off subject and becomes a bit wordy for my liking, although, through the magic of Griffin's writing, he eventually comes back around, seamlessly connecting the dots. Anne Griffin's storytelling is incredible and up there with some of the greats. Very talented and adepth at giving each character a voice of their own despite the fact that they are all introduced through the eyes of Maurice. With all of that being said, had I not been reading this as an ARC with the promise of a review, I may have given up on this book around the 50% mark. It just wasn't for me and that fact has nothing to do with the quality of Anne Griffin's prose. I found myself bored at times, feeling like this story really had no direction, no plateau, no progression at all, especially since the reader already knows the ending from the get-go. I've no doubt that most will fall in love with this story so I certainly do not discourage any reader from adding it to their shelves. I'm in no way put off from reading a book by this author in the future. For me, this particular effort feels like a premise that has been done before and better. Here we go again. While everyone else is sparkly happy because they’re seeing a zillion stars, I’m sort of grumpy, because all I can see in my sky are 3 stars, no matter how much I squint. Well, three-and-a-half stars, if I’m being fair. Sigh. Funny, the blurb and the glowing reviews are so good, they almost convince me that I loved the book. But then I get real—it wasn’t a wow for me, it just wasn’t. This is the story of an old man named Maurice, who, while sitting on a barstool, toasts the five most important people in his life. Maurice’s life has lots of regret, guilt, and grief, as well as some everlasting love. The cool thing about Maurice is that he’s self-aware. He’s quick to see his faults and failures—and he’s apologetic. It’s impossible not to like the guy. He has a plan, which is obvious from the beginning. It doesn’t ruin it that you know what’s going on. Griffin is an excellent writer; the language is sophisticated and the sentences sound so good together. The tone is enticing and never sentimental. It’s a cool structure—Maurice sitting on a barstool, telling us all about his life, delving into the personalities and interactions of those he loves. The first-person narration made me feel all cozy. And talk about depth of character! Check that box off! We get to see how complex Maurice is, but we see what makes the other characters tick, too. Well, there’s one exception: Maurice’s sister-in-law, Noreen. She seems stereotypical, and the dialogue and situations involving her are predictable and flat. Plus (and I’m going to be vague here to avoid spoilers) going into it I assumed her problem was one thing, but in fact it was something else. I think this should have been made clearer at the beginning. It was a rough start for me because of the opening paragraph. It bugged me beyond belief. Okay, I know it’s the editor in me. How could none of Griffin’s editors have seen it?? It’s the first few sentences, for God’s sake. All eyes should be on it. Okay, I’ll stop my whining and explain what the hell I’m talking about. You win the prize if you can figure out what the eff my problem is. Okay, here’s the deal. The shorter you get, the HIGHER the barstools. I swear to God. Trust me. I’m short, and my whole life I’ve complained about tall furniture (what’s blissfully normal to you regular-sized people). This includes counter tops, kitchen shelves, etc., and they’re total pains. I’ve never liked having to climb onto a barstool, or any stool for that matter, but now that I’m an old fart, it’s way worse. Yes, I know, the mere act of climbing is the big problem, but the shorter you are, the more daunting the task and the higher the mountain. Feet hanging in the air! The shorter you get, the taller everyone and everything else look, including barstools!! I must have reread that opening a dozen times, working myself into quite a tizzy. Spatial relations aren’t my strong suit—you’d be smart not to ask me to be the navigator on our next car trip, and if you do, don’t you dare stare in disbelief as I turn the map upside-down to make sense of it. So trying to visualize the barstools and vantage points in the story was not easy or pleasurable. But I am convinced that the opening text is all wrong. I will listen intensely if anyone tells me I’m full of it, but they’ll have to explain it in way simple terms. No, I wasn’t so bratty as to give this book 3 stars because of the opening. The reason I only saw 3 stars in the sky is because I was bored reading most of the book. Great sentences and great characters don’t always mean you’re going to be grabbed and be gleefully held hostage. Bottom line, it was a chore to read and I wanted it to be over already so I could pick up my next book. I will say that the last toast, to his wife, Sadie, did pull me in and I did look forward to picking the book up at that point. I was emotional and attached when reading about Maurice and Sadie’s relationship. That’s why I added the half star. Now that I’ve gone all editor on you, I will say there was one other small logistical problem about some tea that was about to spill. Super minor, but problems like that are annoying. And then we have the “Sadie and me went somewhere” instead of the correct “Sadie and I went somewhere.” I realize that the author was going for authenticity—so many people say it wrong, and so does Maurice. It’s just that the wrong was everywhere, and I don’t know, I think if readers hear it wrong a zillion times, they’ll think that’s correct English and more people will repeat the crime. It grated on my nerves every time I read it. But this is just me, folks, being a pain. Would I check out this new author’s next book? I think so. Am I sorry I read this one? I am not. Griffin is a good storyteller; maybe her next one will wow me. Thanks to several smart and kind people who left comments, I am no longer baffled by barstools! Thank you thank you thank you! Turns out, it’s all about perspective. I was stuck seeing the barstools from a standing position. Then, oh yes, they look super high up as you prepare for the Mt. Everest climb. But the author’s perspective was different: she was talking about Maurice’s view while sitting on the barstool. Okay, so sit on the stool. If you’ve gotten shorter with age, the bar is going to be higher up than when you sat there all younger and taller. The bar maybe was at your waist before, but now it’s at chest level. It would seem to you as if the stool had gotten lower, an illusion. Seems so obvious to me, now, lol. In my defense, it would have helped if the author had made it clear that Maurice was already on the stool. I’m spatially impaired, so I need some accommodation! On the other hand, I probably should have deduced he was sitting, like everyone else did. Mystery solved, yahoo! This quiet novel almost had a Kent Haruf feel to it, but told with an Irish lilt in the written words. The ones we have loved and lost stay with us for a lifetime. They live on in our memories and in the memories of others who knew them. An old man reflects upon his life. Sad and touching without being cloying. Woo hoo!! Just got my copy... won this in a Goodreads giveaway! :) This never happens!! EEEEK with excitement. Thank you to the publisher St. Martin's Press / Thomas Dunne Books who provided an advance reader copy via NetGalley. This was a moving and very quick read about a widower of two years who desperately misses his wife Sadie. The story takes place in Dublin, Ireland. Maurice Hannigan is 84 years old. As he sits at the bar of a local hotel nursing one of many whiskeys, he's toasting, reminiscing, and sometimes making amends with important people in his life. It's as if he's narrating his whole life Thank you to the publisher St. Martin's Press / Thomas Dunne Books who provided an advance reader copy via NetGalley. This was a moving and very quick read about a widower of two years who desperately misses his wife Sadie. The story takes place in Dublin, Ireland. Maurice Hannigan is 84 years old. As he sits at the bar of a local hotel nursing one of many whiskeys, he's toasting, reminiscing, and sometimes making amends with important people in his life. It's as if he's narrating his whole life (in his mind) to his adult son Kevin, who is a journalist living in the United States. I most enjoyed Maurice's recounting of his childhood. He lived on a small farm with his family where he idolized his older brother Tony. In fact, when asked as a child what he wanted to be when he grew up, he honestly and innocently answered, "Tony." He was looking forward to going to school but soon realized he had learning difficulties. Tony was very encouraging and supportive, and even when he himself graduated from school would take the time out to walk Maurice to school in the morning. It soon became evident that further schooling was futile and at a certain point the school master told Maurice's parents that he should abandon school and work on the farm. He also worked with his mother at the Dollard house, which figured hugely in his life. His mother used to work there early in the morning baking bread and also fancy pastries (if there was special company). Mr. Dollard was an alcoholic and extremely abusive towards his son Thomas. Thomas in turn would inflict his rage upon Maurice, when he could be found in close range. In fact, he left a scar on Maurice's face, but Maurice left an even bigger impression on Thomas in the end. In fact, Maurice would find himself in a love and hate relationship with the Dollard house, which later transformed into a hotel and bar. First I saw that John Boyne recommended this book and then I saw five star reviews from several Goodreads members whose opinions I respect so of course I had to read it. And what a beautiful book it turned out to be! I guess I am a total sucker for books about charming Irish men and 84 year old Maurice Hannigan is certainly charming. The whole book takes place between 6.25 pm and midnight on Saturday 7th June 2014, the second anniversary of the death of Maurice's much loved wife Sadie. He drinks First I saw that John Boyne recommended this book and then I saw five star reviews from several Goodreads members whose opinions I respect so of course I had to read it. And what a beautiful book it turned out to be! I guess I am a total sucker for books about charming Irish men and 84 year old Maurice Hannigan is certainly charming. The whole book takes place between 6.25 pm and midnight on Saturday 7th June 2014, the second anniversary of the death of Maurice's much loved wife Sadie. He drinks five toasts throughout the evening to each of the five most important people in his life and tells why they meant so much to him. The reader gradually gathers the whole story of his life and starts to understand his intentions. It was all so beautifully Irish, sometimes uplifting, sometimes so sad, frequently fey and always so beautifully written. John Boyne says it best. "An extraordinary novel, a poetic writer, and a story that moved me to tears." I recieved this via goodreads giveaways ,thanks! All my opinions are my own. They're I recieved this via goodreads giveaways ,thanks! All my opinions are my own. This song kept running through my mind when I was reading this. Not everything is applicable but the spirit of it I think fits nicely. I don't remember who said it was the Irish that were the best storytellers (Glen Hansard maybe?) but it's definitely right here. This is one of those books that makes me so happy I am a reader. We follow Maurice through his life as he toasts each person and tells the story of why they were important to him and instrumental in his life. He tells the story at his own pace and doesn't skip the warts of it all either. Some instances I felt for him, other times I felt sad/pity for him, and sometimes I just wanted to smack him upside the head or take him aside and tell him to stop being an idiot. Through it all though, I understood him in a way and never stopped being an eager listener. It felt like I was keeping him company beside his barstool and a fly on the wall when he was back in the past. It feels precious when he opens up, this man who kept things close to the vest. I guessed what he was planning early on.. Maurice doesn't keep it a secret but he doesn't lay everything out all at once either. Another one Pop Pop would have liked methinks. The ending is sad but a little bit beautiful in that way (to me at least)... it had me gripping the book a bit tighter and reading slower.. not wanting to say goodbye. The writing is so gorgeous and atmospheric but isn't loud and in your face... it's a quiet thing, letting you come to it. Make sense? When All is Said is a poignant and heartfelt novel. It is slow, flawed, and beautiful and I got emotional many times while reading it. Maurice sits at a bar alone looking back over his life and makes a toast to five people who influenced and changed his life: his brother, his daughter, his sister-in-law, his son, and his wife. He’s a cantankerous old man, in some ways reminiscent of Ove (A Man Called Ove), but where that book had dry humor this one is steeped in nostalgia. Early on you can see w When All is Said is a poignant and heartfelt novel. It is slow, flawed, and beautiful and I got emotional many times while reading it. Maurice sits at a bar alone looking back over his life and makes a toast to five people who influenced and changed his life: his brother, his daughter, his sister-in-law, his son, and his wife. He’s a cantankerous old man, in some ways reminiscent of Ove (A Man Called Ove), but where that book had dry humor this one is steeped in nostalgia. Early on you can see where it’s heading but when you get there, you’re still gutted. The writing is that of a seasoned author, yet I believe this is Griffin's debut book. I'm eagerly awaiting her next novel where I hope she can mend the broken heart she left me with. I am stunned. In the last 24 hours, I've been intimately involved in 84 year old Maurice Hannigan's life. Now I'm going to toast him and Anne Griffin. A truly emotional read. Just superb. Mike Succinct but powerfully said, Brenda. Glad to see your stars for this one. Can't wait to meet Maurice for myself. Jean Isn’t this a wonderful book?! Glad you loved it too. Oh man, this is a tough one. It is not often the case that I look at glowing reviews and think 'did we read the same book?!' but here we are... I was convinced beyond a shadow of a doubt that I was going to love this, too! When All Is Said is a contemporary Irish novel about an old man named Maurice who's looking back at his life and giving a toast to the five people who had the greatest influence on him, most of whom are already dead. So it's a premise that promises nostalgia and regret and hea Oh man, this is a tough one. It is not often the case that I look at glowing reviews and think 'did we read the same book?!' but here we are... I was convinced beyond a shadow of a doubt that I was going to love this, too! 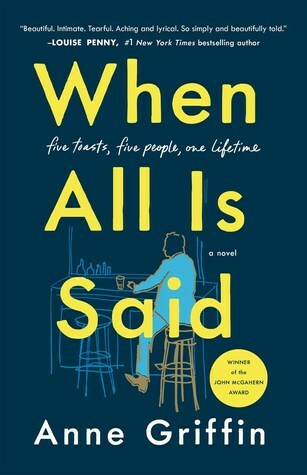 When All Is Said is a contemporary Irish novel about an old man named Maurice who's looking back at his life and giving a toast to the five people who had the greatest influence on him, most of whom are already dead. So it's a premise that promises nostalgia and regret and heartache, but I never really felt any of it. But her story is like the wind under the front door, whistling its way through the crevices, getting through the cracks in my skin. It's so hard to lose your best friend at any time, but to do so at such a young age was pure cruel. At sixteen I was heading into my life. Having travelled those precious years with Tony by my side, I now had to venture forth into the most significant of them alone. Without his guidance, his cajoling, his slagging. It didn't feel possible. It's too articulate, it's too on the nose. Funny that this is called 'When All Is Said,' because that was exactly my problem: nothing is left unsaid. There is no room for the reader to think or feel anything organically, because we are told exactly how we should think and feel about Maurice's story. This was missing tension, nuance, thematic complexity. I'll concede that Maurice is a well-constructed character, and that Anne Griffin makes a real effort to weave together moments of joy with moments of sorrow to paint a three-dimensional picture of this character's life, I just felt utterly empty while reading this. Well, I can certainly see why this is one of the most anticipated books of 2019. It has a quiet, understated beauty to it that captures your heart right from the beginning; I knew pretty early on this was going to be an emotive experience, and I wasn't wrong. It doesn't shout its message, it merely whispers it, but it's all the more powerful because of that. This is a profound, moving and bittersweet story, and main character Maurice is a loveable, lonely guy of a certain age who is reminiscing Well, I can certainly see why this is one of the most anticipated books of 2019. It has a quiet, understated beauty to it that captures your heart right from the beginning; I knew pretty early on this was going to be an emotive experience, and I wasn't wrong. It doesn't shout its message, it merely whispers it, but it's all the more powerful because of that. This is a profound, moving and bittersweet story, and main character Maurice is a loveable, lonely guy of a certain age who is reminiscing about his life and loved ones, all of whom left him long ago. The minor characters are all shown through the eyes of Maury which was an interesting concept in itself. There are some real tearjerker moments but also some which never fail to make you laugh-out-loud. Griffin writes in such a way that it is virtually impossible to not be enamoured with her poignant story. Essentially this is a sad tale, but the author manages to perfectly balance the light and shade to keep the narrative from becoming too unbalanced. The beautiful, inspirational message within the pages tells us to forgive others and, most importantly, forgive ourselves; we, as humans, are not infallible, so being able to forgive is an integral part of living. This is an unforgettable debut that is well worth picking up, especially for fans of John Boyne, as this reminded me very much of his emotionally-charged plots. I look forward to reading more from Griffin in, hopefully, the not too distant future. 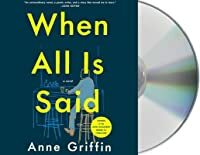 Anne's debut novel ‘When All Is Said’ will be published by Sceptre in the UK and Ireland on 24th January, 2019 and by Thomas Dunne Books in the US and Canada on the 5th March, 2019. It will also be published by Rowohlt Verlag in Germany, Delcourt in France, by Harper Collins Holland in the Netherlands, by Wydawnictwo Czarna in Poland, and by Tyto Alba in Lithuania .